The fourth in a series of Research-to-Impact briefs by Chapin Hall at the University of Chicago on understanding and addressing youth homelessness. Missed Opportunities: Counting Youth Experiencing Homelessness in America summarizes key lessons learned from conducting point-in-time counts of youth experiencing homelessness in 22 diverse counties across the United States. Youth counts can provide communities with valuable information about the number and characteristics of youth experiencing homelessness, including information about over-represented groups for whom specialized services might be needed. Additionally, by conducting annual or biennial youth counts, communities can identify changes over time in the local population of youth experiencing homelessness. 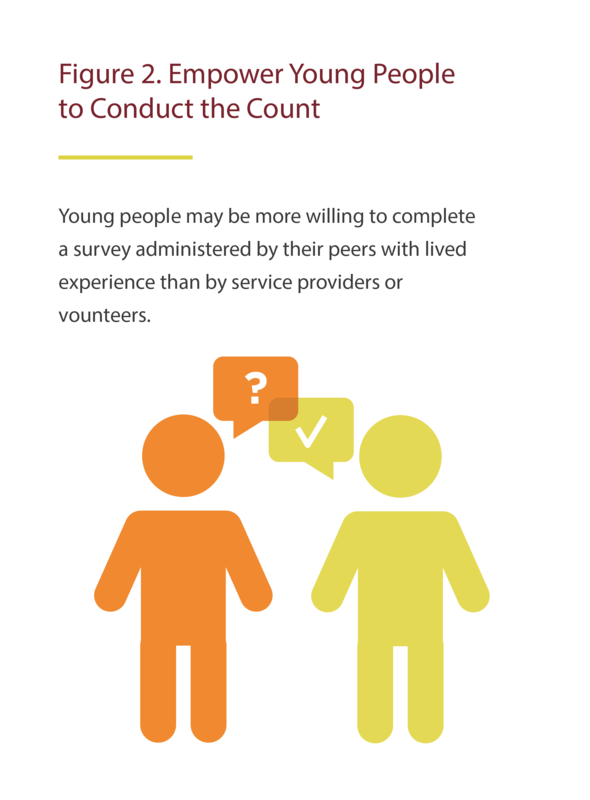 This brief offers recommendations for conducting successful youth counts based on our experiences conducting counts and insights shared by our partner counties. We hope these recommendations will help more communities conduct youth counts that yield valuable data and drive positive change. This Research-to-Impact brief is the fourth in a series that draws on Chapin Hall’s Voices of Youth Count, a national research and policy initiative designed to fill critical gaps in the nation’s knowledge about homelessness among unaccompanied youth and young adults, ages 13 to 25. Adolescence and young adulthood represent critical developmental periods. Every day young people experience homelessness is a missed opportunity to support healthy development and ensure that all young people can reach their full potential. Communities can only make progress toward preventing and ending youth homelessness if they have data on the size and composition of the local population of youth who are experiencing homelessness. However, data on the number and characteristics of youth experiencing homelessness can be difficult to obtain. Youth counts are one approach communities can use to gather this information. Counts can also identify subgroups of youth who may be experiencing homelessness at higher than average rates. Knowing which young people are at higher risk can help guide local planning efforts, particularly when paired with data on the current supply of housing and supportive services. Moreover, if the same approach is used over time, youth counts can be used to track changes in the size or composition of the population of youth experiencing homelessness. Youth counts also present an opportunity to connect youth who are not engaged in services with service providers, build a foundation for cross-system collaboration, mobilize the community, and empower young people who have experienced homelessness by involving them as full partners in youth count planning and execution. In this brief, Voices of Youth Count highlights key lessons learned from conducting counts of youth experiencing homelessness in 22 diverse counties across the U.S. We draw on our own experiences and the insights shared by some of our partner counties. Additional guidance on how to conduct youth counts can be found in the Voices of Youth Count Toolkit. This online resource provides a step-by-step roadmap for how to count youth experiencing homelessness using our approach. Communities can use this brief together with the toolkit to plan and conduct successful youth counts that move them closer to ending youth homelessness. Voices of Youth Count is a national research and policy initiative designed to fill critical gaps in the nation’s knowledge about homelessness among unaccompanied youth and young adults, ages 13 to 25. Voices of Youth Count elevates the voices of young people from across our nation who lack the necessary support and resources to reach their full potential and make unique contributions to society. Voices of Youth Count involved a range of data collection activities including point-in-time (PIT) counts of youth experiencing homelessness in 22 counties across the U.S. that were conducted in the summer of 2016. Our partner counties were randomly selected to be geographically diverse and to vary in their population density and service infrastructure for youth experiencing homelessness. In each county, Voices of Youth Count identified a lead agency to oversee the local activities and engage stakeholders in the youth count. 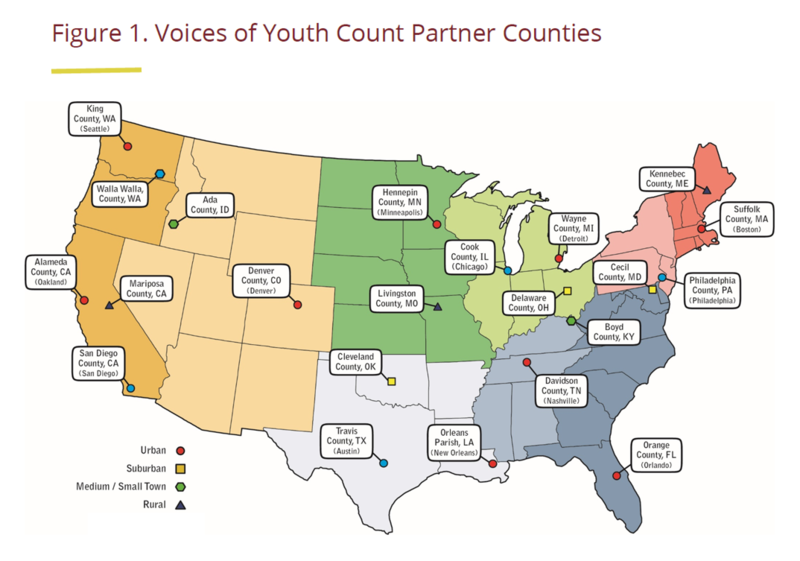 Building upon and incorporating promising practices, Voices of Youth Count conducted youth counts using a consistent approach with each of the partner counties. Our approach involved surveying youth in locations where youth experiencing homelessness were likely to be found. A total of 4,139 youth experiencing homelessness were surveyed. Surveying youth allowed us to determine whether youth were experiencing homelessness based on our definition, rather than relying on visual cues alone, and to gather information about their demographic and other characteristics. An additional 833 youth who were unwilling or unable to complete the survey were counted. This brief highlights lessons learned from conducting these point-in-time youth counts. Engaging a diverse group of youth who have lived experience with homelessness is vital to the success of any youth count. In each of our partner counties, youth participated in planning meetings and helped determine where and when to count. They identified locations where youth experiencing homelessness were likely to be found, such as libraries, parks, social service agencies, street corners, 24-hour retail establishments, and places with free Wi-Fi. Some of these locations were unknown to local service providers. Youth also gathered data during the counts by tallying the youth they observed and surveying those same youth. We believe that having youth administer the survey may have increased participation rates because young people may have been more willing to complete a survey administered by their peers than by service providers or community volunteers. "The strong involvement of youth in our work has also been really empowering. We weren’t always sure how to have youth at the table and make sure their involvement was meaningful, but Voices encouraged us to bring youth to the table and just figure it out. It forced us to step outside of what we knew and where we were comfortable to build an unprecedented partnership with youth and young adults in our community." Voices of Youth Count recommends compensating youth partners for their participation in all count-related activities. Compensation may allow more youth to participate, and it sends a clear message that youth contributions matter. Voices of Youth Count paid youth who helped plan and conduct our youth counts $10/hour. Engaging youth in count-related activities can also be empowering. In many of our partner counties, young people who helped plan and conduct the count wanted to become more involved in promoting positive change in their communities. Because youth experiencing homelessness seek and receive help from a variety of sources, we collaborated with a broad range of stakeholders to plan and conduct our counts. The critical stakeholders will vary depending on the community, but we suggest including homeless youth service providers and representatives from at least three additional groups: other youth-serving organizations, homeless adult and family service providers, and schools and school districts. 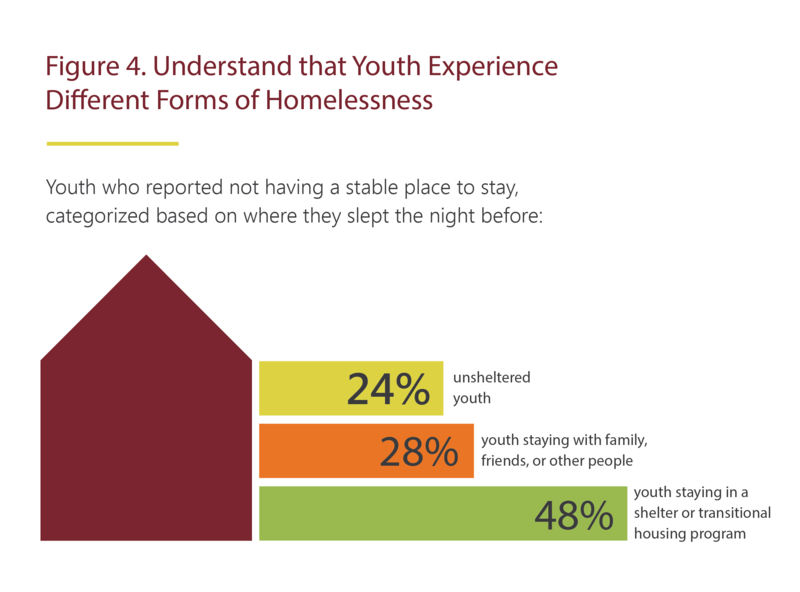 Many youth experiencing homelessness are not connected to homeless service providers and may not frequent the locations where other youth experiencing homelessness are likely to be found. However, they may be connected with other organizations that serve youth, such as health clinics, neighborhood centers, LGBTQ-focused agencies, and providers of free meals. These organizations can “get out the word” about the count and serve as locations where youth can “come and be counted,” thereby increasing the chance that youth who are not connected to homeless service providers will be represented in the count. Youth experiencing homelessness — particularly those ages 18 and older—are often served by shelters and other programs designed for single adults, families experiencing homelessness, and domestic violence survivors. Involving these service providers in count planning and execution is critical if the count is to capture the young people they serve. McKinney-Vento liaisons and other public school personnel can play a vital role in youth counts, especially when it comes to identifying minors experiencing homelessness who are not living with a parent or legal guardian. Although schools must comply with federal laws, such as the Family Education Rights and Privacy Act (FERPA) and the Protection of Pupil Rights Amendment (PPRA) to the General Education Provisions Act,1 they can raise awareness of the count and encourage students experiencing homelessness to participate. School systems can also establish memoranda of understanding with Continuums of Care (CoCs) to play an even larger role in the count, such as sharing data that do not include student names or any other personally identifying information with the CoC. Because a significant amount of planning is needed to facilitate school engagement in count activities, Voices of Youth Count recommends starting to work with schools well in advance of the count. We also recommend reaching out to local community colleges, 4-year colleges, and universities where young people ages 18 and older experiencing homelessness may also be found. In addition to these three groups of stakeholders, communities might want to involve public libraries, other service providers, and faith-based organizations. These organizations may serve youth who do not otherwise access services and can help expand the reach of the youth count. "We knew what systems would be key players, but what ended up being really critical was bringing the right people from those agencies to the table." The decision a community makes about when to conduct its youth count is important. Our counts all took place during the summer months, which limited school engagement. Conducting youth counts during the academic year might increase the ability of schools to participate, as long as the counts do not conflict with standardized testing dates. School participation can be especially helpful in more rural areas where there are fewer service providers. Communities might also consider conducting youth counts on days when free meals are served or during other activities that might attract youth experiencing homelessness. However, communities should avoid scheduling youth counts on days when large numbers of youth from other communities are likely to be present. Communities should also consider whether to conduct youth counts in conjunction with the biennial January PIT count that is mandated by the U.S. Department of Housing and Urban Development (HUD) or whether to conduct a stand-alone youth count at a different time of the year. Although a stand-alone youth count offers communities more flexibility, a youth count that is integrated into the biennial PIT count conserves resources and leverages a larger mobilization effort. Communities conducting youth counts as part of their biennial PIT count may want to incorporate some of the strategies recommended in this brief and in the VoYC toolkit. Another important decision communities make about youth counts is how long they will last. Each of our counts lasted 24 hours, and in some counties, youth were missed because they did not learn about the count until after it was over. To reduce the chance that youth experiencing homelessness will be missed, communities are increasingly counting youth over several days. A multiday count requires more resources and community support and can increase the risk that some youth will be double counted. However, this risk can be mitigated by collecting information that can be used to identify youth who may have been counted more than once (see Lesson 6). Unlike the HUD-mandated PIT counts, which do not include youth who are couch surfing or doubled up, for example, the counts conducted by Voices of Youth Count included any youth who reported not having a stable place to stay. Over a quarter of these youth had stayed with family, friends, or other people the night before the count. Had Voices of Youth Count only counted youth who HUD requires communities to count, these youth would not have been included. Including these youth is important because they also need services and supports. Youth staying temporarily with family, friends, or other people can be especially difficult to find. Voices of Youth Count recommends hosting magnet events that offer food and other resources to increase the chances of counting all youth. Youth can inform the strategies that communities use to market their magnet events through social media, word of mouth, or other methods, as well as the decisions that communities make about where and when their magnet events will be held. Youth input is critical to maximize the chance of attracting youth who might not consider themselves homeless and minimize the chance that youth who don’t want to be found will remain hidden. Counting youth who are not connected to homeless service providers can also be a challenge. To increase the chances of identifying these youth, Voices of Youth Count recommends counting youth at other locations where youth receive services or are likely to frequent. Examples include health clinics, neighborhood centers, LGBTQ organizations, public libraries, and coffee shops. Additionally, because many youth experiencing homelessness are young parents, counting youth at organizations that serve families with young children could also increase the number of youth included in the count. Mapping the locations where youth experiencing homelessness are likely to be found in advance of the count allows communities to use their limited resources more efficiently. This is especially important when the count covers a large geographic area. Youth input is critical to mapping, although service providers should be involved. Youth were the experts with respect to where and when to conduct the counts in the Voices of Youth Count partner counties. They identified indoor locations (such as libraries and coffee shops) and outdoor locations (such as parks) where youth experiencing homelessness are likely to be found. Some of these locations were previously unknown to service providers. Youth also provided information about the time of day young people were most likely to be found in those locations. Voices of Youth Count recommends reviewing the list of mapped locations with youth just prior to the count to confirm that those are still locations where youth experiencing homelessness are likely to be found. This review is especially critical following inclement weather or police activity in the area. We also recommend being flexible during the count so that youth who are congregating in unmapped locations can be counted. Identify youth experiencing homelessness by asking young people where they slept the night before the count. This will yield more reliable results than relying on visual cues alone, because youth experiencing homelessness may take great pains to avoid appearing homeless. In fact, 37 percent of the youth who completed the Voices of Youth Count survey were excluded from the count total because they indicated they had a stable place to stay. Consequently, Voices of Youth Count recommends using a survey-based approach rather than, or in addition to, an approach based exclusively on observation. "We’ve realized how important data can be for demonstrating how important it is to help youth if we really want to end homelessness in San Diego. In our PIT count, we asked individuals when they first experienced homelessness and about 1/3 stated that their first experience of homelessness was before the age of 24." Conducting a survey-based count also allows communities to gather information about the demographic and other characteristics of youth experiencing homelessness and identify groups who may be experiencing homelessness at a higher than average rate. For example, African Americans comprise about 15 percent of the U.S. population of 13- to 25-year-olds, but 47 percent of the youth experiencing homelessness who completed the Voices of Youth Count survey identified as African American. "The extent to which youth are disproportionately system-involved highlighted the need to bring juvenile justice and child protective services to the table." Survey data can help communities identify youth who may have been counted more than once, particularly if they include initials and dates of birth. This is especially important when youth are counted over multiple days. There may be situations when it is either not safe or not feasible to survey youth, such as when youth do not consent to being surveyed or are sleeping. Communities may choose to respond to these situations by counting youth as homeless based on other evidence, such as the presence of backpacks or sleeping bags. HUD requires CoCs to collect certain demographic information about all individuals, including youth, who are counted during the biennial PIT count. Beyond that, communities may collect additional data to inform local efforts to prevent and end youth homelessness. Voices of Youth Count recommends using standardized questions that have been shown to be reliable and valid rather than developing questions that have not been used before. However, youth input is important to ensure that questions are relevant, respectful, easily understood, and appropriately sequenced. To increase the likelihood that youth will respond to all questions, Voices of Youth Count also recommends that the survey be no longer than a single page. Communities that want to gather more information can ask a random subsample of youth to complete a longer survey in exchange for a sizeable incentive. Ultimately, the choices communities make about survey content and length should be driven by the purposes for which they want to use the data. For example, if communities want to track changes in the population of youth experiencing homelessness over time, it is important that survey instruments remain substantially the same from one year to the next. Homeless Management Information Systems (HMIS) data are collected by agencies that serve individuals and families experiencing or at risk for homelessness. Communities can use HMIS data to help identify youth who were receiving services but not surveyed, including youth served by homeless adult or family service providers that were not engaged in the count. If HMIS data are not available, communities can survey youth at all the shelters and transitional housing programs that enter data into the HMIS. Missed Opportunities: Counting Youth Experiencing Homelessness in America offers insights from Voices of Youth Count’s experience conducting youth counts in 22 diverse counties across the U.S. Counting youth experiencing homelessness can be challenging; youth counts are time and labor intensive. Effective counts require extensive planning, significant community mobilization, extensive youth engagement, and ample resources. However, youth counts can provide communities with valuable information about the number and characteristics of youth experiencing homelessness, including information about over-represented groups for whom specialized services might be needed. Additionally, by conducting annual or biennial youth counts, communities can identify changes in the local population of youth experiencing homelessness over time. Communities can enhance the value of their youth count data by gathering information from homeless service providers about the types of housing and supportive services available to young people experiencing homelessness and using those data to guide decision making around the investment of resources. Youth counts can also mobilize support for efforts to prevent and end homelessness among youth, empower young people to become leaders in those efforts, and help communities access additional local, state, and federal funds to address the needs of youth experiencing homelessness. "The data from Voices has been really important. We used it to push for funding at the state level to address youth homelessness." Youth counts do have limitations. Point-in-time snapshots cannot capture all the youth who experience homelessness during the course of a year and are likely to miss youth who are not on the street or connected to homeless service providers. Furthermore, youth counts do not provide information about how youth move into and out of homelessness over time. Thus, communities might want to consider how youth count data can be combined with other sources of information—such as HMIS data, data collected from service providers, and qualitative data gathered through interviews or focus groups with youth—to inform decisions about service provision and guide local efforts to prevent and end youth homelessness. Engage youth who have lived experience with homelessness in all aspects of planning and execution of the youth count. See Lesson 1. Engage a broad range of service providers and other stakeholders in the planning and execution of the youth count. See Lesson 2. Carefully consider when to conduct the youth count and how long it should last. See Lesson 3. Count youth experiencing all different forms of homelessness, including those whose homelessness might be more hidden. See Lesson 4. Work with youth and service providers to map the locations where youth experiencing homelessness are likely to be found. See Lesson 5. Conduct a survey-based count rather than, or in addition to, an observation-based count. See Lesson 6. Carefully design the survey to yield actionable data. See Lesson 7. Supplement youth count data with HMIS data from CoCs. See Lesson 8. Continuum of Care (COC): A Continuum of Care is a regional or local body designed to promote community-wide planning and strategic use of resources to address homelessness among individuals (including unaccompanied youth) and families experiencing homelessness. Homelessness: We use the term homelessness to describe the experience of sleeping in places in which people are not meant to live, staying in shelters, or temporarily staying with others (“couch surfing”), and not having a safe and stable alternative. Voices of Youth Count focuses on homelessness among youth who are not accompanied by a parent or guardian. Homeless Management Information Systems (HMIS): HMIS is a data system used to collect client-level data and data on the provision of housing and services to homeless individuals, families, and people at risk of homelessness. Each CoC is required to have an HMIS that complies with HUD’s data collection, management, and reporting standards. McKinney-Vento liaison: The McKinney-Vento Homeless Assistance Act, reauthorized in 2015 by the Every Student Succeeds Act, guarantees educational rights and supports for students experiencing homelessness, and seeks to remove any barriers these students may face in succeeding in school. The Act requires every school district to appoint a homeless education liaison who is responsible for ensuring that students experiencing homelessness are identified and receive the transportation and educational services for which they are eligible. Point-in-Time (PIT) Count: HUD requires CoCs to conduct an annual count of homeless individuals and families staying in emergency shelters and transitional housing (sheltered). HUD also requires a biennial count of homeless individuals and families staying in places not designed or ordinarily used for sleeping (unsheltered) on a single night. Both counts must be conducted during the last 10 days in January but CoCs can use a variety of approaches. Youth: Voices of Youth Count defines youth as individuals between 13 and 25 years old. This definition aligns with language in the 2008 reauthorization of the Runaway and Homeless Youth Act. However, we distinguish between minors (ages 13-17) and young adults (ages 18-25). 1. FERPA restricts the ability of schools to share student information without parental consent and PPRA requires school districts to obtain parental consent for youth to participate in a survey. 2. U.S. Interagency Council on Homelessness. (2018). Criteria and benchmarks for achieving the goal of ending youth homelessness. Washington, DC: USICH. This brief is the result of a collaboration between Voices of Youth Count, based at Chapin Hall at the University of Chicago, and many partners. The authors wish to acknowledge important contributions from Alison Chrisler, Elizabeth Dierksheide, Anne Farrell, Marrianne McMullen, Forrest Moore, Bryan Samuels, and Mallory VanMeeter, as well as the methodological and technical expertise provided by the Voices of Youth Count Technical Advisors. Data collection for the national survey and follow-up interviews was conducted by Gallup, Inc. alongside its U.S. Politics and Economics Daily Tracking Survey. Professional services were provided by Bowerbird Communications and UChicago Creative. Voices of Youth Count is made possible through a grant from U.S. Department of Housing and Urban Development’s Office of Policy Development and Research and generous support from other funders including Chapin Hall, Arcus Foundation, Ballmer Group Philanthropy, Bill & Melinda Gates Foundation, Campion Foundation, Casey Family Programs, Dr. Inger Davis, Elton John AIDS Foundation, Liberty Mutual Foundation, Melville Charitable Trust, and Raikes Foundation. Dworsky, A., Horwitz, B. (2018). Missed opportunities: Counting Youth Experiencing Homelessness in America. Chicago, IL: Chapin Hall at the University of Chicago. Chapin Hall is an independent policy research center at the University of Chicago focused on providing public and private decision-makers with rigorous data analysis and achievable solutions to support them in improving the lives of society’s most vulnerable children. Chapin Hall partners with policymakers, practitioners, and philanthropists at the forefront of research and policy development by applying a unique blend of scientific research, real world experience, and policy expertise to construct actionable information, practical tools, and, ultimately, positive change for children, youth, and families. Voices of Youth Count is an unprecedented policy research initiative to understand, address and prevent youth homelessness in America. Infused with youth voices and strengthened by reach into nearly 30,000 U.S. households and 22 diverse communities, the research provides robust information to support effective policies, practices and programs that will end youth homelessness. More information can be found online at voicesofyouthcount.org.